Normally auditions are held in the beginning of each term (spring/autumn), but may also be held at other times if needed. For more information please contact our conductor Staffan Holst. Let him know voice you sing, which year you are born. Please let us also know about your music background. What happens during the audition? Solo song. You sing a song of your own choice with our without accompaniment. Note reading. You sing your voice in a choir song chosen by us during the audition. Auditory test. You sing intervals after listening to them on the piano. 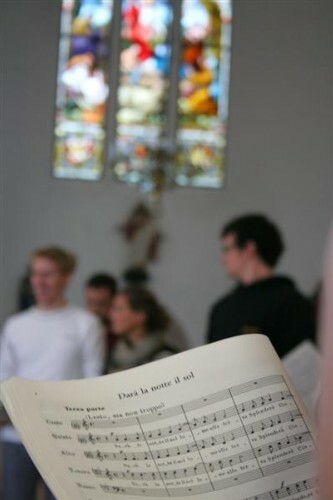 Our rehearsals take place each Wednesday night between 7 and 9.45 p.m. Further rehearsals, in particular in conjunction with concerts, will take place. In general, attendance of all rehearsals is compulsory.